In large cities, "The subway ate my homework" is about as common an excuse for being late to work as the ol' doctor's appointment. No one actually believes it. 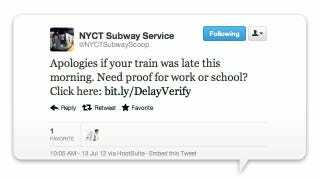 Luckily, New York's MTA has an online system that gives you city-certified proof you're telling the truth. Problem is, it's slower than the city's trains. Please do not reply to this message as this Mailbox is not monitored.